Growing up, we took a family vacation every summer. The summer I turned 14, we drove from Oklahoma to Florida. I remember listening to Blame It On The Rain over and over on my Walkman. I also remember fighting with my sisters across the entire state of Louisiana because they were breathing too loud, they wouldn’t stay on their side of the seat, and/or they touched my Walkman. Family vacations are a rite of passage, a privilege not a right. Or at least that’s what my dad yelled when he was threatening to turn the van around in Mississippi. The vacation my family took the summer I turned 14? 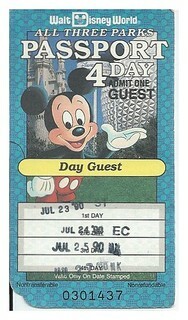 Four days at Disney World and it was magic. Apparently it was so magical that my mother only took two photos. But she kept her ticket for 22 years so there’s that. 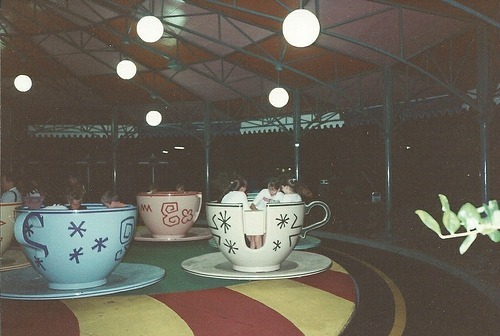 I remember being so overcome with the spirit of Disney that I spun our teacup so fast and my sister that suffers from motion sickness was screaming that she wanted to get out. My sister is the one on the left about to hurl. Good thing my mother captured this moment. 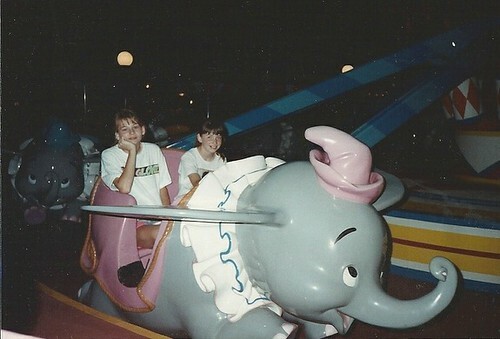 As punishment, my mother made me go on the Dumbo ride with my younger sister approximately 49 times. In a row. Oh, what’s that, a photo or it never happened? I’m not sure if my favorite thing about this photo is my total lack of enthusiasm, my bangs, or my Body Glove shirt and shorts ensemble. You can’t tell from the photo, but I’m willing to bet my Walkman I’m wearing Keds. Without laces. And two pairs of slouch socks. I feel like my kids need their very own family vacation experience, so when Radisson Hotels approached me with a sweet giveaway opportunity I agreed. I mean, one of the best things about vacation is staying in a hotel, amirite? Radisson Hotels is celebrating their 50th! anniversary with a 50 Years, 50 Days, 50 Rooms sweepstakes. To celebrate fifty years of Radisson, they are giving away 50 rooms on 50 blogs and today? It’s my turn. You will need to enter the giveaway through the Rafflecopter widget below, simply follow the prompts. The giveaway will close Thursday December 6th at 11:59PM EST and I will use Random.org to select the lucky winner. I will then pass along the winner’s name and email address to Radisson so that they can issue the voucher. Be sure to check out Radisson’s Facebook page for more chances to win. Just so you know, I received three vouchers for hosting the giveaway. 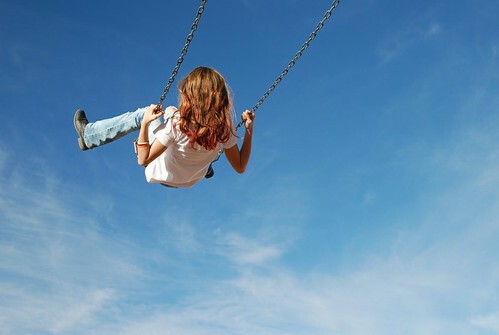 I consider myself pretty laid back with the kids (and laundry), I let them do their own thing and I try not to hover. Zoe will be 12 in January and reminds me of this fact regularly, so I try to give her the benefit of the doubt when it comes to her handling what she needs to handle. Unlike most almost 12 year olds, she has to handle Type One Diabetes. Since she’s been diagnosed, I make sure I change her lancet every night, I always make sure she has enough supplies in her bag, and she has the appropriate snacks and glucose tabs. She checks her blood sugar on her own, she has no problem poking her own fingers. She calculates her dose, draws up the insulin, and then hunts me down to give her the injection. She can give her own shot, but she usually just rams the needle through her jeans INTO HER LEG and this makes me almost faint. She has absolutely no fat on her body and she ends up with a gigantic bruise with that injection method. I prefer to give her the shot because GOOD LORD. I’ve been trying to back off a bit regarding the upkeep of her diabetes bag because if she wants to carry around 16 used syringes and 39 blood soaked test strips, so be it. It drives me straight cray, but it’s totally not cool for your mom to follow you around and clean out your bag because “I’m almost 12, Mom” and insert eye roll here. She went to dinner with my mom and my sister the other night and a few hours later, when it was time for her bedtime insulin, she came into my room with her kit and had a weird look on her face. She “guessed” that she was a 250, gave herself 10 units of insulin (probably through her jeans), put that used needle in her bag, ate a hamburger and french fries, and went on with her life. She was a 204, a bit high, but not bad for a guess. But still. Not in the slightest, my sweet girl. After all, you are only almost 12.